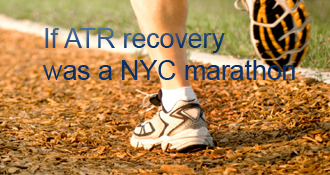 achillias has completed the grueling 26.2 ATR miles to full recovery! I am a little more than 14 weeks past my surgery and am quickly regaining strength and mobility. I can do calf rises just fine, and I feel like I could take off running if I wanted to, although I’m waiting a little longer to try that. Strangely, though, as I regain my calf strength, the muscle appears more misshapen, relative to my good calf, than it did early in the recovery. A little background: I injured my calf muscle about three months before I tore my achilles. It felt like a bad tear, but the clinic doctor I saw suggested there was nothing that could be done, so I just tried to rehab it. In hindsight, everyone seems to agree that this tear likely contributed to the achilles injury, and part of my PT involves working the scar tissue in the calf. That calf muscle now looks like it is balled up and misshapen, and it is more noticeable as I regain strength and size. Is this simply due to routine muscle atrophy? Has anyone else had a similar experience? My concern is that the initial calf injury was much worse than I realized (imaging was never done to assess the damage). My calf currently looks and feels as if one of the muscle strands or ligaments that pulls the calf down toward the achilles is missing, causing the muscle to bunch up nearly the top of shin. Will this work itself out? I haven’t posted in a while, mostly because the recovery has been going so well. It has been 10 weeks since my surgery, and I am walking in two shoes, without a limp. Physical therapy has been incredibly helpful, and my ability to walk is returning just in time for the warm weather. After getting the cast off, every day has been better than the last, which has put me in a damn good mood. The only issue I’m having now is soreness in my right Achilles (i.e., my good one). I assume this is just because of overuse as I compensated for my torn left Achilles. But, I have never felt this type of tightness and soreness in that area, except right before I had the ATR. After seeing a few posts about the higher likelihood of a second rupture, I am particularly paranoid and sensitive to Achilles soreness. Has anyone had a similar experience with their good leg? I can imagine nothing more frustrating than rupturing my right Achilles just as my left one heals. After the surgery, I was in a cast a total of four weeks, which turned out to be about one week too many. I had the second cast removed yesterday, 30 days after the operation. A few days prior to removal, I started to experience severe itching and irritation, caused by hair regrowing around the surgical site. The day before the cast removal, it transitioned from itching to pain, and I started to worry about infection or something more serious. By that point, I was counting down the minutes until the cast came off. When it did, the sight wasn’t pretty. I had a giant blister, about the size of a quarter, on the inside of my heel. The area around my incision was very red and covered in much small blisters and bumps. The incision itself looked alright, although it was definitely more irritated than it should have been at this stage. My excitement about getting the cast removed had faded when I saw the state of my leg. It felt a little like a setback, and was disappointing for a couple of reasons. First, it wouldn’t have happened if I hadn’t been in the cast for so long. It seems that others have transitioned to a boot at two or three weeks, and I wish my doctor wasn’t quite so conservative about that timeline. Second, it’s frustrating because it is partly my fault. I made it worse by rubbing my leg against the inside of my cast to scratch my itch, and by beginning partial weight bearing in the cast, even though the doctor recommended no weight bearing at that stage. The doctor didn’t seem to think it looked infected (in his two-minute evaluation). My main concern now is making sure it stays that way. I suppose I should consider myself fortunate that itching has been the worst of my problems since the surgery. But when it is keeping me up at night and there is nothing I can do to reach it, I start counting down the days until I get rid of this cast. The wound itching wasn’t bad, and it was expected as part of the healing process. But they shaved my entire lower leg for the surgery, and as the hair grows back it is setting my skin on fire. I haven’t found a good solution yet. Icing seems to help. Pulling on the gauze in my cast allows me to indirectly scratch the itch, but it probably just irritates the skin more. Does anyone else have ideas? I’m currently two weeks post-op. A few days ago, I started noticing sores on the tops of my toes. At first, I thought they were bug or spider bites, because they were red and itchy. But there was also blistering on the bottoms of my toes, which suggested something else like foot ulcers or a circulation issue. Here’s the strange thing: This is not on my surgery leg. It’s on the toes of my good foot. So before I ruptured my Achilles, I had plans to take a 3-hour flight on March 20. But when I asked my surgeon, he recommended waiting a couple of months after surgery before flying. This is in part because he thought it would be difficult to navigate airport security and a cramped airplane while non-weight bearing (he takes the conservative route). But it is also due to the elevated risk of blood clots and DVT while flying. Has anyone else received similar advice? My surgery was on March 2, so the flight would be less than three weeks post-op. I certainly don’t want to risk DVT, but it seems as if my surgeon is being extremely cautious about this. I have read that others have flown within a few weeks after surgery, and it seems like precautions could be taken to prevent clotting. Thoughts? It has only been four days, but I have been pleasantly surprised by the lack of post-op pain. The pain was pretty severe immediately after the surgery (7/10), and it was difficult to sleep that night. However, once the pain medication kicked in, it went away and just never came back. I stopped taking the pain medication less than 24 hours after surgery and have been fine. I’m talking 0/10 on the pain scale. Is this a common experience? I was expecting it to be more painful for a longer period of time. I’m actually surprised that a large incision in the back of my leg could be so painless. Not that I’m complaining. My surgery–initially scheduled for this Thursday–was moved forward thanks to an opening in the schedule, and I had it done yesterday. Overall, it seems to have been a success. The pain was pretty severe initially, and it was very difficult to sleep last night. But now the medication seems to be kicking in, and the pain is much more manageable. Not bad. The only unexpected outcome was that I woke up with a busted lip and what looks like the beginnings of two black eyes. My entire face was sore and sensitive to the touch. Has this happened to anyone else? I thought that maybe I hit something as they were trying to turn me over on the operating table. But I’ve read elsewhere that some people thrash around while under anesthesia, and that could be the cause. The doctor didn’t mention anything after the operation and it’s not a bad injury, but it is strange trying to figure out what happened while I was unconscious. So my scheduled surgery will be more than three weeks after the initial injury. Everything I have read and heard suggests it is better to do the surgery soon after the injury, but I can’t find any details about why, exactly. Is the surgical repair more difficult? Does waiting make the recovery process less successful? I’m concerned, but not sure why. The delay also makes it seem like my recovery has not yet begun. The ER doctor put me in a boot, which I have been wearing since. He said it was fine to put weight on it, and after the first few painful days, I am full weight bearing without discomfort. At this point, though, I am not actually healing. I am just living my life with a torn Achilles until surgery day finally arrives. I have brows latest function in lots of effort, this is helping for me for accessing the bing search history and get help in browser cleaning. if you want to need this free platform then follow there given link and make your browser fast. This is coming from first hand experience, I wouldn’t take the risk. The fracture clinic doctor advised me that I was ok to take a 4 hour flight 3 weeks post Achilles rupture (non surgical healing route), no clot prevention was advised and they had also told me that I didn’t need to continue with Clexane. Less than 2 weeks after I returned, (and after I had been seen by a doctor again at the fracture clinic who failed to pick up on the lack of deterioration in my calf muscle), I suffered a bilateral or saddle pulmonary embolism which almost killed me. Please consider the risks and make sure your doctor is on point before you make a decision on flying! my doctor waited 1 1/2 mo. to operate. this is so madening. Im 65. This sounds like hell just because I given Cipro antibiotic. This drug caused my rupture. My comments echo those above. I mainly felt soreness in my good heel during my cast and crutches days. I too was quite paranoid. But since I’ve moved more and more to 2 feet, I don’t really notice it anymore. Yes I had some soreness in the “good” ankle/ achilles, but definitely felt like it was primarily from overuse as the injured achilles healed. Now that I am favoring the good side less, snd am 10-1/2 weeks post op, most of that soreness has disappeared. Hope you have a similar result as you continue to heal. Yes there is an increased risk to the other tendon and yes most of us have an increased sorness in it due to overuse. Mine continued for a while and then would come and go. I ended up having some radial shock wave therapy on the non-ruptured tendon (also the ruptured one to break up scar tissue) and had new orthotics fitted. Since then it has been fine and that has been well over a year. I don;t always wear my orthotics so the therapy must have contributed. Thoughts of rupturing the other tendon will probably be in your head for a while but the chances are not as high as your brain is telling you. Continued with eccentric loading of the tendons and do the same or as much as you are able to do with both tendons (don’t just work the injured leg). Also stand on a theraband with your entire foot and hold it up so it flexes your toes then push against it with your toes (3 sets of 10). This will help some other supportive tissue. Thanks for asking, donna. Sorry for the late reply. I went to the doctor and there were no signs of infection. There was some yellow discharge, but that turned out to be just the natural fluid from the blistering. Everything seems to be scabbing over and recovering now. Hope you are doing ok and feeling better. How are you doing? Any signs of infection? I think its because you rubbing it and put pressure on it so you make some part of the wound irritated. In my case i set a goal to get my wound heal first as early a i can. Then once heal i will start focusing on the WB and ROM. Just don’t rush we all have different cast. Some are tight some are a bit loose and some are perfect . Thats why others do PWB while on cast (not recommended). The wound is very critical while still on cast. So first thing first don’t focus on the Achilles Tendon while on cast. After 2weeks post op (in Cast)I am on Cam Walker since yesterday . I remember after surgery the Doc told me that i will be in cast for 4 weeks. But i challenge myself to get the wound heal within 2 weeks( thats my first post op appointment). So when he checked yesterday he is very happy and told me that incision is very good and minimal swelling and I can use the Cam Walker. Just be very Careful when you are on boots it doesn’t protect much the same as cast and you don’t wanna slip and hit or use your injured Foot. Otherwise you gonna start again.. (Hope and Pray that this won’t happen to all of us) . thanks for the response. Which boot are you in? I’m actually growing more concerned about infection. I keep getting a yellow looking discharge on the gauze around my incision, and the whole area looks very red and inflamed. May schedule an appointment (with someone other than my orthopedic surgeon) to get it evaluated soon. Yeah, I’m in a boot now, with one heel wedge in place (not sure what the angle is). I haven’t started physical therapy, but my foot isn’t very mobile at the moment. I can wiggle it up and down just a little. Glad you are not in the cast anymore. Looks like you and me are in the same boat as far as timeline goes. Are you in a boot now? Is your foot at 90 degrees and did you have any issues getting into it? Whats your foot mobility? I took high strength fish oil capsules each day and had no issues with itching at all. I found the tip on mumsnet whilst googling to get information on living with a cast. There’s no scientific data to back up the fish oil thing but it worked for me and the lady on mumsnet. Oh…another thought…at day 25 you don’t need to be in a cast…you could try to get into a boot now it that’s in your protocol. I know of others who had bad itching or cast claustrophobia so they got a boot early. Can’t hurt to ask. I really feel for you…if you can take Benadryl it worked for someone I know and it causes drowsiness so it’s a good sleep aid. My problem wasn’t itching I had cast claustrophobia…panic like anxiety attacks, I had to constantly touch my toes to alleviate it. Good luck! I will be 2 weeks post op of ATR. I’m flying with my family to Florida (two 2.5 hour flights with a layover in between. My husband is an orthopedic surgeon and he and my foot/ankle surgeon think it’s fine. I have been taking a baby aspirin daily since surgery and have not needed any pain meds at all during recovery. I am to have my first follow up visit 2 days before our flight and will either get a boot or a bivalve cast to ensure no problems with swelling. I think traveling for the first 2 weeks should be avoided but if you don’t have any risk factors for DVT you should be fine. I’m fully expecting it to be exhausting but I do not want to deprive my 3 children their spring break vacation! Athletes foot perhaps? I don’t think it is related to your ATR. I haven’t had it myself but it sounds like the symptoms are similar- of course a GP would be able to confirm and give you treatment options. No idea achillias…let us know how it turns out…I’m assuming you’ll ask your doc about it. Just wanted to let you know that I flew yesterday- 2 weeks post op in a.cast. When I saw surgeon I inquired about aspirin and after some thought he said it couldn’t hurt so I took 2 night befor and 2 morning of. I had middle seat and was able to prop my cast up on my boyfriends leg who had the aisle seat. I had wheelchair assistance on both ends of flight. Overall it went fine and had no complications or issues. Surgeon said after two weeks blood clots are not likely, but technically could happen at anytime. here is what i found out when i did my research. Im flying in 3 weeks for 9 hours. I will be 11 weeks post op at that time. 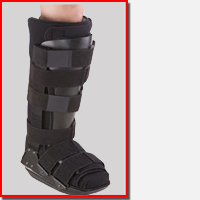 Will you be in a cast still or in a boot? When flying, passengers are normally sedentary and immobilized. This is a problem because it is the contraction of muscles in the legs, normally caused by motion and movement, that allows blood to circulate back to the heart. When the body is immobilized, blood pools in the legs, and this increases the risk of clotting. Additionally, when seated for a lengthy amount of time, the knees remain at a right angle, resulting in a “kink” in the veins of the legs, preventing proper circulation. The dryness of the recirculated air on planes can leave its passengers dehydrated. This leads to the blood to become concentrated and more prone to clotting without the proper amount of hydrating fluids. I did not fly after ATR surgery. But, I flew in a cast and on crutches after an ankle fracture. You can make the logistics work. But, even in my more 20’s, it was EXHAUSTING. If you do it, be sure to get one of those airport carts to drive you around and leave yourself plenty of extra time. I had a layover in Dallas-Fort Worth and that big airport almost did me in! You will also benefit from having as little as possible in terms of baggage. Perhaps you can ship things via FedEx to your final destination so that you can travel with just a back pack. I asked my doctor about flying after surgery and he said his only concern was me not being able to elevate my foot for such a long period of time. Hopefully other than that you’ll be fine. Goodluck! Like donna, I also had to self inject every day with a blood thinner (clexane) although I had to do for 7 weeks my leg was in a cast. I was also told to keep wearinh the surgery compression socks for 2 weeks after the operation. Yes Andy…I think the way doctors deal with the possibility of DVT and ATR surgery is as individual as protocols. I had to self administer one shot a day in my stomach of Lovenox for three weeks (21days) because of blood clot concerns. My Doctor was pretty adamant about it and his reasoning was sound to me at the time. I also had to wear a compression sock for three weeks on the unaffected leg. To clarify, My Dr. suggested 1 aspirin every day after surgery till further notice. My Dr. told me even before I had surgery that I should take 1 aspirin every day. That’s the only thing he said I should take other than pain meds if I need them. I know of other Drs. That recommend the same. I am seeing my Dr. tomorrow and will ask him what he thinks about flying soon after surgery. I agree with Stuart not only for this question but for a lot of the information you find on this site…I wouldn’t do it just because others have. May I suggest to both of you to call your general practitioner to get another opinion? The doctor that cares for you regularly that really knows you and your health. That way you’ll feel better going or know to change your plans. If you google “flying after surgery” you’ll get lots of information. From what I read it is OK after two weeks. It does seem mainly to do with blood clots. There are things you can do to lessen your chance of a blood clot such as compression socks and asprin. LindaF, I’m sorry for making you nervous. Like I said, I kind of think my doctor is being overly cautious and conservative about this. From what I have read, two weeks is the general guideline, and the risk is highest on long international flights. It sounds like you will be fine, especially if you move around and stay hydrated during the flight. I wish I hadn’t cancelled my travel plans already! I just called the airline - United and they do not have any policy about leg casts, so I am OK to fly from their perspective. I am also in the non weight bearing phase so it is going to be challenging. Also, the airline reserved a wheel chair for me when I arrive at airport. I do have a travel companion, so I will have help. However, I am also traveling with my cat which will be a lot to juggle. I asked about reserving a seat with extra leg room- and they said that I needed to handle that when I arrive at the airport. I will ask my doctor about the blood clot risk when I see him Thursday and see if he wants to prescribe something for me. achillias- Your comment is getting me nervous….. I actually got injured 2-1/2 weeks ago while away in Florida for the winter. I had surgery 1-1/2 weeks ago. All along I told my surgeon that I was scheduled to fly back to NJ on 3/13 ( which is Friday), which is only about two weeks post surgery. Initially, he thought it might be early to go home (though not sure why). However, when I was there last week and 1 week post op- he thought my incision looked really good and he said as long as everything looks good this week when he takes out stitches I can fly back as planned. This is a 2-1/2 hour flight. I am 51 female and they did not treat me for blood clot risk factors at any point during the surgery or recovery ( though I see others are treated with asprin or some other method post surgery). I had asked about blood clot risk prior to my surgery and they said because I am only in a 1/2 knee cast and I can be mobile on my knee scooter and wiggle my toes- I guess they really didn’t see that as a real risk factor. Some airlines have a no fly policy with leg casts for this reason. I remember a while back someone getting his cast off and into a boot in order to fly. Yes there are drugs to prevent clots and they can be prescribed by another doctor like your GP. Managing the airport should be easy as many now have wheelchairs and you can book them in advance. My concern would be the length of the flight and much better if you have someone going with you to assist but certainly would not do it without anti-clotting drugs. It really comes down to the risks and whether you are prepared to take them. I would not rely on simply on others have done it so it should be OK. I am right there with you. First two days I was in a fog. Well maybe it was a day and a half as I got home at about 6pm. Pain was an 8 on a ten and I didn’t take enough of the meds. Next day was brutal and took the recommended dosage and pain went away but it was really strange being on that strong of a medication. The next day I completely got off of all of the drugs and switched to over the counter meds. Everyone is a while I get a strange twinge/fire pain thing but it only lasts for a second or two and back to not feeling anything again. I am two weeks into my cast and three weeks left to go. Hope my stiches are healing correctly and that there are no complications. The second night after surgery I started to get pain in my heel but manged to get it under control using over the counter pain relief. I was then taking pills for a week but in hindsight I could have probably stopped them earlier as didn’t suffer from any pain at all. Almost no pain until week 8 when standing PT started. Wish I could tell you you’ll continue to be pain free, from my own experience and that of other bloggers pain will come and go as your recovery progresses…for me it’s never been so bad I couldn’t deal with it. Some seem to have more pain, some less, but no one NO pain over the whole process. Generally achenes on a range of 2 -4 where the repair was done, still even at 17 weeks. Occasional intense zaps up to 10 but only lasting seconds a few times a week at end of day or waking me up while sleeping… they can be correlated with new PT moves but not always, I’ve gotten them on rest days when I didn’t do anything much. I remember occasional heel pain when walking in the boot for long periods. Pain along peroneal tendons when getting more mobile before my gait was corrected and I was still limping. Swelling is usually correlated with being up and about or lots of PT. So….ENJOY your pain free days! YAY! I think it varies. I think I was on pain pills for a good week, though maybe not at regular intervals towards the end of the week. Pretty sure by week two I was on to tylenol as needed. I think everyone’s bodies respond differently. Glad you’re feeling pain free! My upper lip was busted as well. I just thought it was the tube they put in your mouth. I had a cold too at time of surgery and my throat was killing me post-op. Sounds like something happened while you were sleeping! I had surgery, was out for ~ 2 hours, and woke up with no cuts, bruises or abrasions. I would definitely request a copy of the “surgery report”. It is your right as a patient. I would be surprised if they would record an incident that caused your damage, but you never know. The surgery report is interesting and it is good to know exactly what they did. I brought mine to my physical therapist so that he would know EXACTLY what he was dealing with. I woke up with an abrasion along my right temple. The nurse told me to put antibiotic ointment on it for a week or so, but provided no explanation. It wasn’t too bad and it’s fine now, but seemed a little weird. In my op report it said I was moved from the stretcher bed to the operating table by a ‘6 person team’. Kind of a funny thing to imagine, and I figured worst case they bumped me while moving me, or as you suggested I had some involuntary thrashing while under the knife. Still, kind of unsettling. I’d ask your surgeon, so at least you have an explanation. Happy healing! achillias’s AchillesBlog is proudly powered by WordPress and WPDesigner..